Designed to withstand eavesdropping, phone tapping and computer hacking, Sensitive Compartmented Information Facilities - also known as SCIFs - are protected areas where classified conversations can be held. 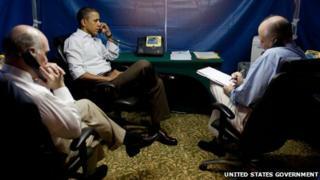 Image caption President Obama can also make secure calls aboard Air Force One. Nothing in a SCIF is allowed to operate on a remote control because that's a frequency that can be tapped. "We never knew if there was someone in the building with a long range listening device," he says. "If we put up a tent in a secure area we knew the president could go in and feel fairly confident that a conversation is private."